HONG KONG—After six months of waking up each Sunday at 5 a.m. for “The Long Run,” after pairs of Nike shoes worn-out and replaced, after over 1,000 kms. of mileage, dozens of Runner’s World magazines read, hours of ‘80’s music on the iPod Nano listened to while bouncing up and down, after booking this trip last December and registering to join my first-ever full Marathon, only three words are left unsaid: THIS IS IT! At 7:45 this morning, a gun will fire and echo along Nathan Road here to signal that, yes, finally, the race has began. 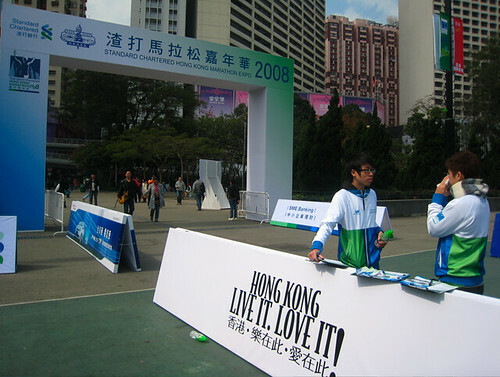 Would you believe: A record 49,947 runners will trample on the cemented roads here to join the 2008 Standard Chartered Hong Kong Marathon. Can you imagine that? Fifty thousand pairs of legs hopping, squeezed together, arms moving front and back, hearts pounding, and lungs huffing and puffing? In weather that’s super-cold at 12 degree Celsius? And how this race has grown. Eleven years ago when this event began in 1997, they only had 1,076 runners—about the same number that ran the Sinulog Half-Marathon we organized in Cebu last Jan. 19. But since then, the numbers have risen and climbed and, I should say, this event is probably the largest running race in Asia. 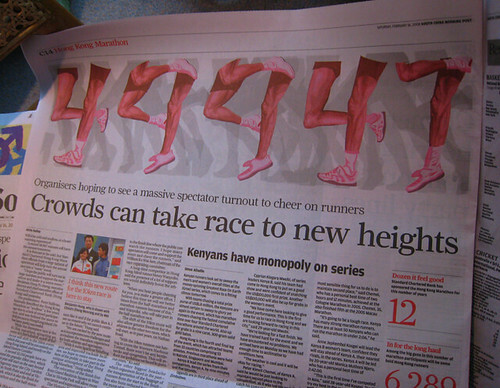 Of the 50,000 running, not everyone will run 42 kms. Most runners are joining the shortest distance: 10-K. How many? That’s 32,154 participants. For the 21-K, there are 11,504; and for the full marathon (that’s 42.195 kms.—the distance from our Cebu Capitol to Carcar), there’ll be 6,289 pairs of foam-padded shoes that will attempt to run from Miramar Hotel in Tsim Sha Tsui down the West Kowloon Highway, further down the Cheung Tsing Tunnel, up the Tsing Ma Bridge, hop on the Ting Kau Bridge, back to Kowloon, then down the Western Harbour Tunnel, until finally emerging in Hong Kong Island to finish at the wide open arena called the Victoria Park. A total of 14 from Cebu are joining. 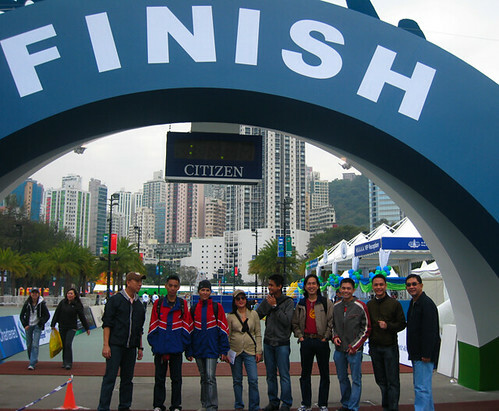 Yesterday, our group visited the Finish Line at Victoria Park to collect our race packs. We met at 9:30 a.m. at the Kowloon Hotel lobby. 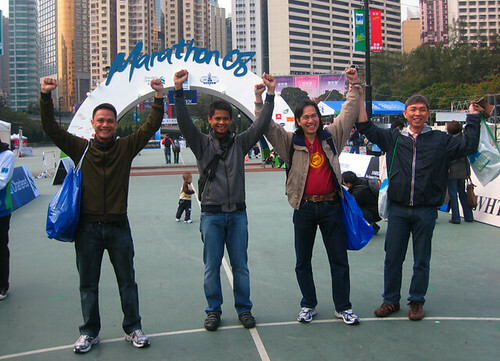 Next, we boarded the MTR subway, emerged at the Causeway Bay area, trekked to the Victoria Park and, as our eyes enlarged at the huge inflatable sign which read “FINISH,” we smiled, snapped photos and wandered around like boys and girls in Disneyland. 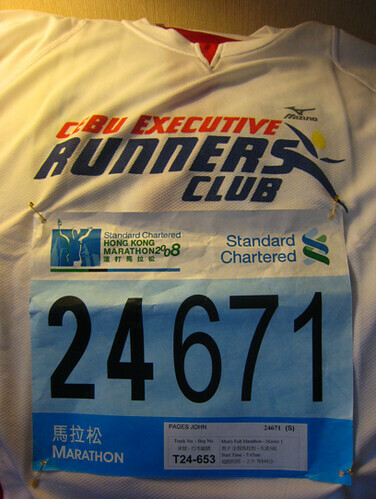 After collecting our race numbers, we lunched at a restaurant in Causeway Bay and ate—what else?—pasta and rice. Same for dinner at the Spaghetti House: pasta, pasta, pasta.And finally, as you read this, we’d have awoken at 4:30 a.m. today to eat a light breakfast, shower, and don our gear. What are we wearing? Mizuno shirts, gloves, beanies, jackets, arm covers, thermal shorts, digital wristwatches, Nike Plus+ devices, iPods, sunglasses, waist straps with water bottles, GU energy gels—a full complement of gadgets as if we’re headed to war. Well, who says the marathon isn’t war? It’s mental warfare. Sure, training and physical prowess and the strong condition of that muscle underneath one’s shirt counts—but so does, maybe more importantly, that tissue found in-between our ears. Can we do it? As Barack Obama would shout: YES WE CAN! i know all of you can do it and i would like to congratulate you in advance…GOOD LUCK. C O N G R A TU LA TI O N S! ! ! ! !